A Medieval motte and bailey castle built in 1068 extended and rebuilt during the 13th and 14th century with 15th century additions. The castle was sold to Madame Tussaud’s in 1978. Warwick Castle is one of England’s finest surviving castles and hosts a variety of events. When after the death of Alfred the Great, his children, Edward the Elder and Ethelfled, the Lady of Mercia, took the field against the Danes, Ethelfled’s first care was the protection of Mercia, and this she effected first by blocking its approaches on the Watling Street, by the commanding forts of Tamworth and Stafford, and next by occupying a strong military position on the Foss Road, the great Roman way which extended from Lincoln to Bath. To block this road and secure Central Mercia, Ethelfled selected a settlement of the Woerings, on a little rise near the sluggish Avon, where she fortified a town in the vicinity of the Foss, which has become our Woeringawic, or Warwick. Then between town and river she caused to be raised one of those great mounds which mark the defensive warfare of that time. The new earthwork would be surmounted with a stockade and wooden blockhouse, to give place, after the lapse of several generations, to the formidable structure of stone in the keep of Warwick Castle. Turkill, a Saxon Thane, was lieutenant of the Earls of Mercia, and after the Conquest was directed by William to erect or strengthen a fortress at Warwick. Ordericus Vitalis, who wrote forty to fifty years only after the Norman invasion, says: “In consequence of these commotions” (the risings in 1068) “the King carefully surveyed the most inaccessible points in the country, and selecting suitable spots, fortified them against the enemy’s excursions. In the English districts there were few fortresses which the Normans called castles, so that though the English were warlike and brave, they were little able to make a determined resistance. One castle the King built at Warwick, and gave it into the custody of Henry, son of Roger de Beaumont; “he was created Earl of Warwick, and in the time of Roger, second earl, this castle was grown to be a notable place of strength. Roger died 1153. This Norman castle seems to have lasted nearly 200 years, and was destroyed by the adherents of Simon de Montfort, issuing from Kenilworth. To quote Leland: “The magnificent and strong castle of Warwick, at the W.S.W. end of the town, hard by the right ripe of Avon, is set upon an huge rock of stone, and hath three goodly towers on the E. front of it. There is a fair tower on the N. side of it, and in this part of the castle King Richard III. pulled down a piece of the wall, and began and half finished a mighty tower to shoot out great guns, which remaineth unfinished as he left it. The dungeon, now in ruins, stands in the W.N.W. part of the castle”. The rock, on which a part of the fortress stands, is 40 feet above the river, which falls in a cascade below the windows of the great Hall, but on the N. the castle is level with the town. 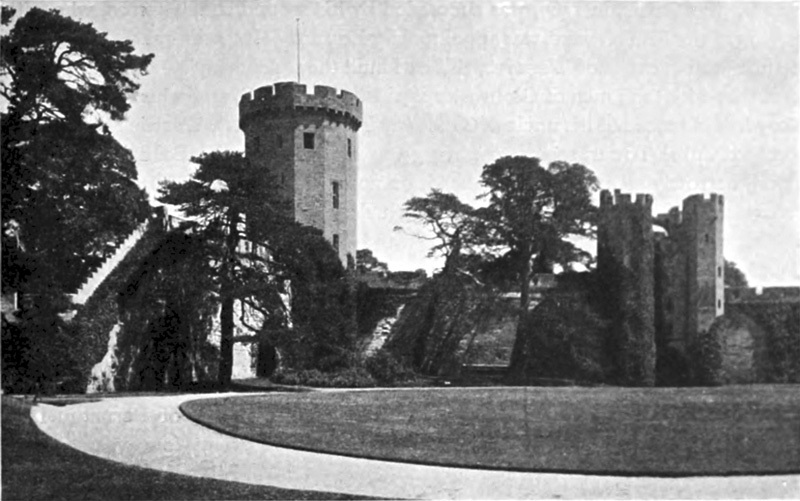 “The entrance to the castle is by a gateway between Guy’s Tower on the right and Caesar’s Tower on the left, which is formed of three circular segments”. Thus far Camden, who gives no particulars as to the building of this noble fortress, though he enlarges considerably on the traditions of the perhaps apocryphal Guy, Earl of Warwick, and his terrible combats and encounters. In Parker’s “Domestic Architecture of the Middle Ages”, to whose careful and trustworthy descriptions and explanations regarding many of the structures given in these pages we owe much valuable information, a considerable space is occupied by various notices of Warwick Castle, and some instructive plans are given of the general arrangements of the fortress. 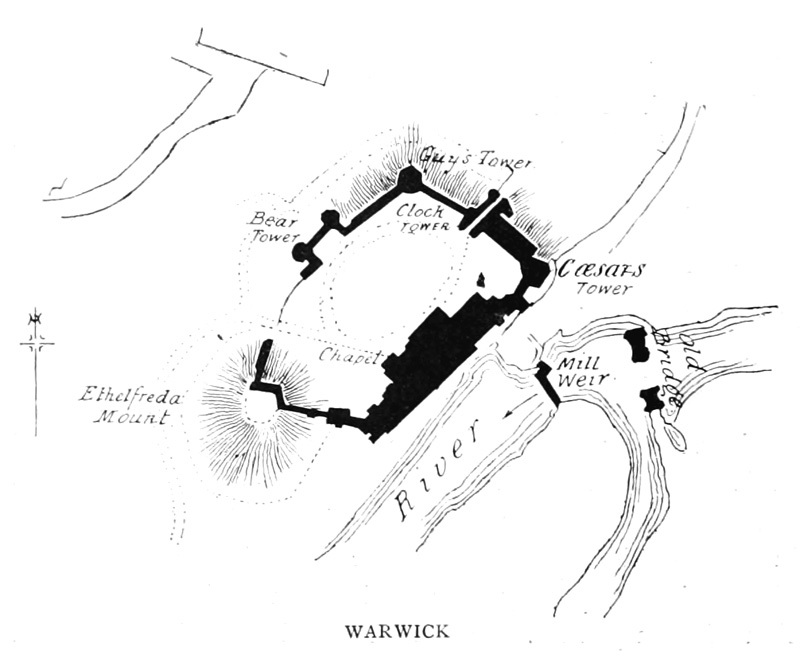 Warwick is an excellent example, in remarkably perfect preservation, of the transition period, when the dreary prison-like stronghold, with its scanty accommodation clustered within the walls of the bailey, if not contained within the defensible building itself, was giving place to a more domestic type, demanded by a higher state of civilisation and refinement. Externally as strong as ever, with embattled and machicolated walls and strong flanking towers wherever necessary, the element of domestic comfort was being introduced, and magnificent suites of apartments and offices were now constructed under the main roof, “gradually preparing, as it were, for the time when the wall of enceinte would be dismissed althogether”. Berkeley Castle is another fine example of the same period almost equally perfect. Warwick was built partly at the end of the fourteenth century, but was not finished until the fifteenth; and it is impossible to trace any part of the castle as erected by Turkill for William the Conqueror, which, again, may have stood on the site of still earlier buildings. It seems to have stood nearly 200 years, but in the time of Henry III. (1256) it was besieged and taken, and a great part of it destroyed. In this state it lay until the tune of Thomas Beauchamp, Earl of Warwick, who died in 1369, and who rebuilt it. To this period therefore, must be referred the Hall and the whole of the earlier portions of the domestic buildings. He also built the magnificent tower known as Caesar’s Tower, and probably the gateway. His son Thomas continued the building, and erected the multangular tower (N.E. ), known as Guy’s Tower, which he completed in 1394, the 17 Richard II. In the reign of Edward IV., George Plantagenet, Duke of Clarence, resided here, and employed himself in making additions to the castle. It is probable that he erected the entrance gateway on the N. side, the loopholes of which appear to be intended for artillery. He had other works in hand, when his career was cut short by his brother in 1478. From that time little care seems to have been taken with the building, until James I. granted it to Sir Fulke Greville, who found it in a ruinous condition, the principal part of it being used as a county gaol. He expended a large sum in repairs, and in adding to both the E. and W. ends of the main building. Since then various alterations and additions have been made, such as the erection of a dining room in front of the hall, and of some offices outside the barbican. In 1871 there was a serious fire, which burnt part of the private apartments of the castle, when a number of the curiosities and works of art were destroyed. 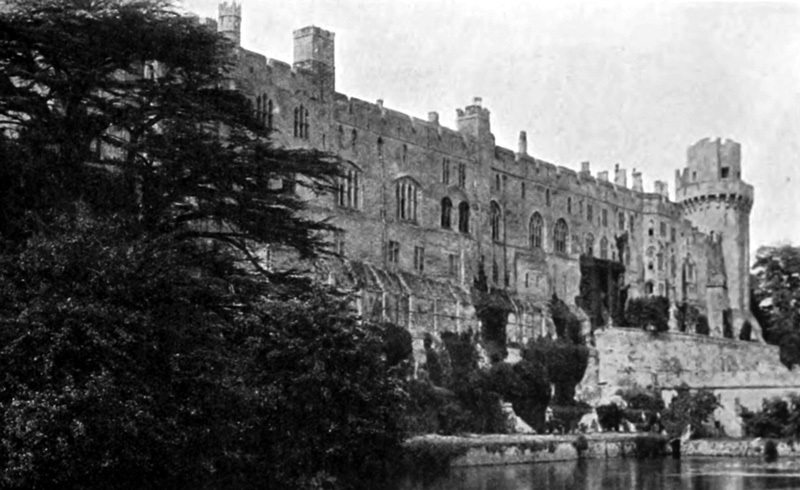 The river Avon defends the S. front of the castle, where the habitable part of the structure is situated, forming one side of a parallelogram, whereof the remaining sides are composed of a lofty and strong wall, with towers at the angles, and having defensible gateways, with flanking towers in the curtains. The two magnificent and lofty towers already mentioned, which flank the E. wall, form the great feature of the place, and “give an air of grandeur and majesty to the castle of which it is not easy to convey an idea”. The main entrance is midway between them, flanked both outside and in with octagonal towers, and having in front a very perfect barbican, remaining almost in its original state, the portcullis of which is still lowered and drawn up every night and morning. The drawbridge has been replaced by a bridge of stone. Turning W. from Guy’s Tower, the wall about the middle of the N. front was broken away, as already mentioned, by Richard III., and here was formed a new N. entrance gateway in later times, the wall being continued in a far feebler section to the W., where it meets the remains of the ancient keep, spoken of before, a small part of which remains, much mutilated and altered. It was probably of the same form externally and the same date as Caesar’s Tower. (Parker.) Thence from the lofty mound of the keep, Ethelfled’s mound, the wall runs down to the watergate and the main front of the castle. The domestic buildings are on two main floors; the basement, containing the kitchens and cellars, bakehouse, &c., the whole being vaulted and groined; and the principal floor having the great hall, with the modern dining-room in front of it, communicating on the E. and W. with the State apartments and bedrooms; and the chapel on the N.W. of the hall. The first Earl Beauchamp of Warwick figures in the Welsh wars of Edward I.; he died 1298, and it was his son, Guy, who fought in the Scottish war under Edward II., and who, acting with the Earls of Lancaster, Hereford, and Arundel, caused the sudden beheading of Edward’s frivolous favourite, Piers Gaveston, on Blacklow Hill, before he could be taken into Warwick Castle; he died 1315. His son, Thomas, served in the French wars of Edward III., and dying of the plague, near Calais, in 1369, was succeeded by his second son, Thomas, who, after serving in the French wars, was appointed by Edward III. to several offices of trust. Retiring to his castle of Warwick, this earl built the stately Guy’s Tower there. 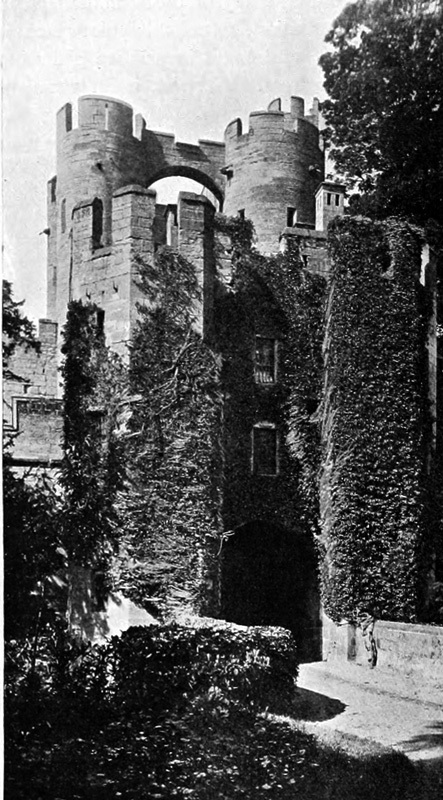 He took part with the Duke of Gloucester against Richard II., and when that youthful King had disposed of his uncle at Calais (see PLESHY, ESSEX), Warwick (who, being confined in the Tower, seems to have given his name to the Beauchamp Tower there), narrowly escaped with his head, on account, Hume says, of his submissive behaviour, but he was sentenced to perpetual imprisonment in the Isle of Man, and his castle and estates were forfeited and given to Thomas Holland, Earl of Kent. Restored by Henry IV., he died 1401, when his son, Richard, succeeded, and was appointed governor to King Henry VI. in his minority; this earl died 1439, at Rouen, and his son, Henry, who succeeded him, dying in his thirty-second year without issue, his title and estates went to the husband of his sister, Richard, Earl of Salisbury, whose sister he had married. Thus the King-maker, Earl of Warwick, derived his title, but he met his death at the battle of Barnet in 1471, and his grandson, Edward, was beheaded when only twenty-four years of age, by Henry VII., on a fictitious pretence, in order to destroy the last remaining male of the line of Plantagenet. Then King Henry VIII. created Dudley de Lisle, son of the Minister of Henry VII. (who was, by his mother, descended from Richard Beauchamp), Earl of Warwick, and afterwards Duke of Northumberland, but he was beheaded by Queen Mary for supporting Lady Jane Grey, his daughter-in-law,-and his son, John, who took up the title, died in prison in 1554.. Elizabeth restored the next brother, Ambrose, to the title, which James I. afterwards conferred on Robert, Lord Rich of Leigh, whose grandson, dying s.p. 1673, left the honour of Warwick to his nearest kinsman of line, Edward, Earl of Warwick and Holland. He died in 1701, and in his family the title became extinct in 1759, when it was revived in the person of Fulke Greville, Earl Brooke, created Earl of Warwick, 1759, in whose family the lands and castle remain.